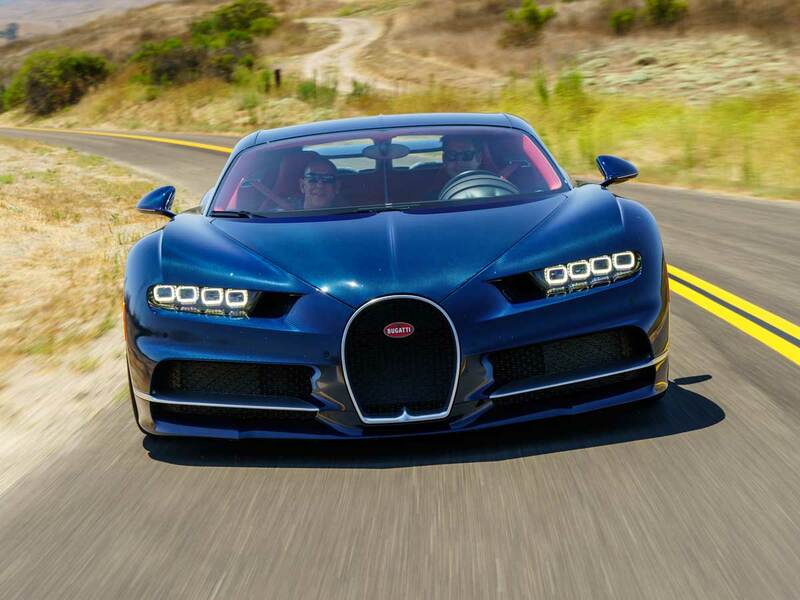 The $3 million, 1,500-horsepower Chiron forces the brain to reconsider the meaning of speed. The all new Bugatti Chiron, a lower, wider, faster and wilder replacement for the venerable Bugatti Veyron, has all the numbers to qualify it as the most insane production car ever made. The price ($2,999,999), the acceleration, the quarter-mile, the 0-186 mph—the Chiron generates such brilliant stats that car watchers and horsepower fiends can experience number blindness looking at them. But the numbers are just numbers. Few people will ever experience the application of power in the Bugatti Chiron, a beautiful rarity, an exquisite curiosity that draws crowds wherever it appears. And where some supercars use numbers as chaff, or a sort of distraction from its relative shortcomings, the Chiron has no chaff—it is all missile. The numbers associated with this elegant monster point to a driving experience that is almost more aerospace than automobile. 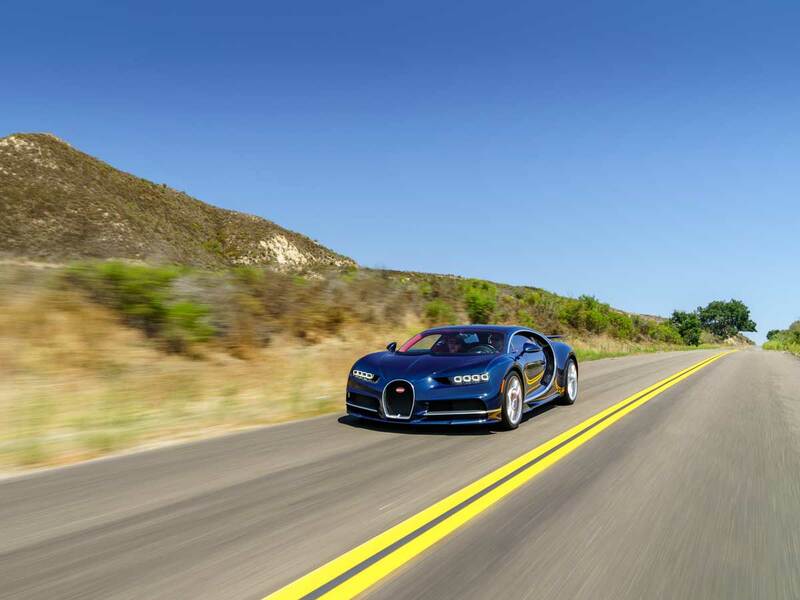 Driving a luminous blue preproduction Bugatti Chiron north on California's Route 154 between Los Angeles and Monterey, in between exhilarating bouts of acceleration and braking, I listen to the symphony of the quad turbos, fuel pumps, four wastegates, and whatever other magical stuff is taking place just behind my head. Then I take a few moments to think about space travel. It's a stretch to associate the wizardry of the Chiron with the power of space travel, but that's the sort of madness that number blindness produces once you actually drive this Bugatti. When NASA launched the Apollo missions 240,000 miles to the moon, it used the massive Saturn V rocket, which also produced big numbers: 160 million horsepower, 7 million pounds of thrust, 5.5 tons of fuel burned every second, a top speed of 25,000 mph. The Apollo program also hoovered up 4.5 percent of the federal budget in 1966. To be sure, a healthy share of parent company Volkswagen's $255 billion in revenue went to developing Bugatti's Veyron and Chiron. Was it worth the expense? I heard a reliable rumor that Volkswagen spent $12 million just on the Chiron's steering system, which nets out to a steering investment of about $24,000 in each of the 500 Chirons VW will build (They already sold more than half that—$750,000,000 in what amount to pre-sales). But the car is astonishingly fast, with a steering system lightyears ahead of its predecessor. And it contains a powertrain so sophisticated the only way to tell if one of the engine's 16 cylinders isn't firing properly is to count the number of ions produced by each explosion—if there are too few or too many, the CPU knows. I wind through a grove of live oak trees in comic-book fast-motion, then I'm on a straightaway and suddenly we're traveling 130 mph. I nail the 8-piston, 16-inch carbon silicon carbide front brakes and the rear wing turns up 45 degrees to grab the air, and the car guy inside me thinks: Yes, it was worth the expense. If I had $3 million, I would have to buy this car, just like America had to go to the moon. The numbers may just be numbers, but the feelings don't lie. How Fast Does the Bugatti Chiron Actually Go? You'd think this would be an easy question to answer. The W-16 engine, which is comprised of two 15-degree V-8s stacked side-by-side to form a 90-degree W-16, produces 1,500 horsepower—that's 50 percent more horses than the original Veyron, which had a nearly identical powertrain. There are tested performance times that Bugatti refers to: it goes from 0-62 in "less than" 2.5 seconds, and from zero to 186 mph in "less than" 13.6 seconds. To move a 4,000-pound coupe (and with an engine that displaces only eight liters) requires an even more ridiculous set of numbers: at full throttle, the four turbos ingest 1,000 liters of air every second, and that maximum horsepower is deployed across a stunning 4,000-rpm wide swath of the power band—from 2,000 to 6,000 rpm. The crowning numerological achievement, most would say, is the top speed of 261 mph, a number that will most certainly rise over the lifespan of the Chiron. And then there are the go-to pub facts: Constant full speed drains the fuel tank in 9 minutes, the torque maxes out at 1,180 pound-feet. The Chiron-spec Michelin Pilot Sport 2s are 285 across in the front, and 355 across in the rear. The 7-speed DSG dual clutch gearbox comes from a particularly remote corner of Volkswagen's top-shelf parts depot. Much of this is incredible, albeit digestible, data. Much of it describes an unprecedented leap in automotive physics (on a "mass production" level). Mere supercars can only doff their caps to performance numbers like these. The McLaren P1, which is one of the finest cars ever made, gets to 186 mph a full three seconds slower than the Bugatti Chiron. And that 0-62 mph number? It's high. That's a Volkswagen thing, to publish conservative performance numbers. According to a source deep inside Bugatti, the 0-62 time is closer to 2.23 seconds. At that point, the all-wheel-drive Chiron exceeds the takeoff speeds of a Formula 1 car. 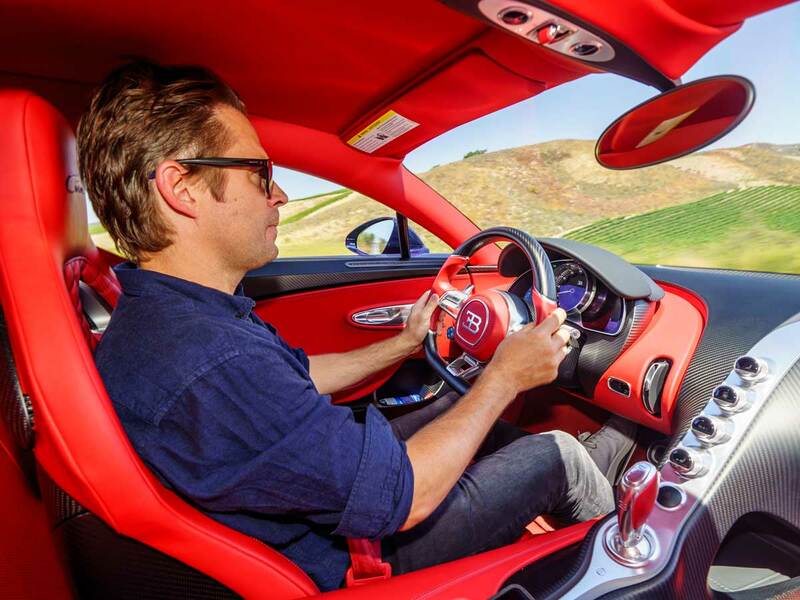 Behind the wheel of the Chiron on that California highway, with a little room to play, I discover acceleration speed that literally made me laugh out loud. I started with the Launch Control. On the Bugatti Chiron's steering wheel is a small button that says "Launch Control." I stopped in the center of a deserted stretched of secondary road, with a view more than a mile ahead of me. I press my left foot hard on the brake. To make LC work in the Chiron, there needs to be more than 100 pounds of line pressure in the brakes. That's a lot. Think about how hard you can press the brakes; it's harder than that. Then press the Launch Control button, then hammer down the accelerator. If you manage to complete all these tasks in sequence in less that two seconds and release the brake, you will experience acceleration so absurd it seems conceptual even as you're experiencing it. I release the brake and suddenly I have no peripheral vision. For a couple seconds I'm in a tunnel, listening the roar of billions of ions gathering in the cylinders behind me, and the sensors silently counting each one. That straight speed is rocketry, and it is what the Chiron really represents. that powerband that stretches across the tachometer, which makes 0-62 as thrill as 70 to 130 or, I presume, 130 to 250. We often use hyperbole to express the performance of supercars. Forget all of that: The speed of the Chiron is immune to hyperbole. It is its embodiment. What are all those crazy sounds? The mid-engine W-16 has four turbos that deploy in two stages. To prevent lag, only two run from a stop. When I roll off the throttle, all four turbos dump their air pressure through wastegates that sound like a bunch of doors opening or closing on the S.S. Enterprise. What else can I hear? I don't know. Each of the 16 cylinders has four valves, the rear wing has active aero, there are fuel pumps moving mass quantities. For a car that has all the NVH qualities comforts of a daily driver, it makes a lot of strange noises. There are six tailpipes at the end of the Chiron's complicated titanium exhaust system. Four of them terminate in a bifurcated center channel above the carbon-fiber diffuser. The outside two actually divert downwards and blow out of the diffuser itself—essentially the same technology that gave Red Bull Racing a serious edge and helped them win four F1 championships before the blown diffuser was banned from the sport. On the Chiron, the blown air is used to re-energize the low pressure air at the back of the diffuser, creating an added bit of rear downforce. This is not built to be a track car. You won't race it against the McLaren P1. The lateral grip, the braking, the outrageous speed. It's meant to elevate your senses, not to dominate your fellow richies at the 'Ring. Why does the Chiron cost $2,999,999? Well, just look at it, for Christ's sake. It's not just an updated Veyron, and it's not merely a supercar. Beyond the technological wizardry packaged inside, the Chiron is a work of art. Every component is hand-milled, handmade, stitched, and assembled in the bucolic Bugatti atelier in Molsheim, France. In the words of Bugatti's chief pilot, 4-time Le Mans winner Andy Wallace, "Everything you see inside the Chiron is exactly what it looks like." Does that small vent in the door sill look like it's made of magnesium, with tiny titanium blades? Then that's what it is. Does that single light switch on the ceiling look and sound like a mechanical aluminum toggle wrapped in a tiny hand-stitched swatch of red leather? That's what it is. Sit inside the comparatively bargain-basement $200,000 Aston Martin DB11, and you'll see plastic that looks like aluminum. The difference, once you've looked inside the Chiron, is massive. The signature Bugatti curve—the same one one that carves a circular motion on each side of the exterior—also divides the interior. It begins on the center console, a simple post with four simple adaptable aluminum dials, then travels past the aluminum and titanium gear selector, and swoops upwards to the ceiling. There is no gaudy infotainment screen to interrupt the nearly pristine interior. There is only leather—lots of it—aluminum, titanium, a dash of magnesium, and glass. As I roar along the highway, I look in the rearview mirror to check for CHP trying desperately to catch me, I discover one of the most exquisite elements of the Chiron: the mirror is an asymmetrical oval, and contained within it are blood-red cylinder head covers, a dorsal fin that runs from the roof to the center of the wing, and the contours of the wing itself. It is one of the most beautiful views in cars today, and one that only a handful of people will ever see.